Christian Capitalism: Is the stock market overvalued? University of Pennsylvania’s Jeremy Siegel has been shooting again at Yale professor Robert Shiller’s stock market valuation model, the cyclically-adjusted price-earnings ratio, or CAPE, according to William L. Watts at The Tell blog on the MarketWatch web site at http://blogs.marketwatch.com/thetell/. CAPE adjusts earnings for price inflation then calculates a 10 year average in order to smooth volatile earnings reports. Clearly, the CAPE P/E isn’t as high as it has been at some points in the past, but those who follow it are worried. Siegel complains that changes in accounting practices in the 1990’s, the “mark-to-market” rules, has biased earnings downward because corporations must take a hit to earnings when the value of assets fall but don’t get to increase earnings when the value of assets rise. He argues that National Income and Product Accounts (NIPA) earnings should be used, instead. NIPA earnings, which would be higher, show a stock market that is fairly valued. Shiller hasn’t responded, yet, but at this point I tend to think Siegel has a valid point on purely technical grounds. What is more important is the error both Shiller and Siegel make in the economic theory that underlies there thinking about investing. 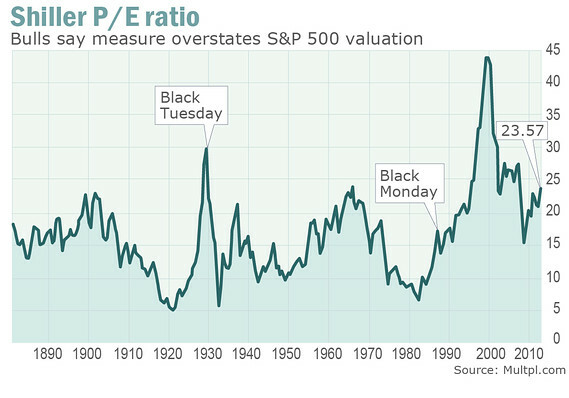 1) Both focus on a long term mean for P/E ratios as if it were an objective measure of value. 2) They assume that the market will revert to mean at some point, which shows that they see the process as random. One of the most important advances in economic theory took place in the 1870’s with the marginal revolution. Stanley Jevons, Karl Menger and Leon Walras get credit for the revolution. Two insights came from marginal thinking: 1) consumers and producers don’t consider the total supply and demand of goods when valuing them, but only the next one that they intend to buy or sell, or the marginal supply and demand; 2) marginal valuation is subjective; there is no objective value for anything. Shiller and Siegel have decided to completely ignore subjective valuation. That’s not surprising because mainstream finance has ignored it for decades and invented all kinds of objective measure of value for financial assets. Subjective value teaches that something is worth what people are willing to pay for it, nothing more or less. P/E ratios tell us what people are willing to pay for their next purchase of stocks, so there can be no such thing as over or undervalued stocks. Stocks are worth what people are willing to pay. The more important signal that P/E sends is the risk tolerance of investors. Higher P/E ratios show that people are willing to tolerate more risk for the same assets. And guess what correlates highly with risk tolerance? The business cycle, of course! In the depths of a recession people can endure little risk, so P/E ratios collapse. As the storm recedes and investors come out of their tornado shelters, P/E ratios rise because investors sense a sunnier future. The series reverts to mean not because it is a random event as mainstream finance assumes, but because it follows the business cycle. Without a sound business cycle theory, investors are left with simple tools like moving averages and reversion to mean as guides to investing. Those tools are better than nothing, but a better understanding of business cycles, as the Austrian business cycle theory provides, offers better guidance. Investors won’t be able to time changes in P/E ratios, or risk tolerance, to the exact month, but they will be in a better position to anticipate them.